Many of you will be aware, our first year’s anniversary is Monday. Because we’re still discovering the joys of Seattle, we decided to stay at home and do some of the stuff that we haven’t up to this point. Darwin, in her infinite grace, decided to let us sleep in this morning. Now, please understand that I’m not complaining (hear that Darwin!? I’m not complaining! ), but it has become her habit to sit in the doorway of our bedroom at 4:00 in the morning and cry and cry and cry. Getting her food doesn’t solve the problem; it’s as if she simply thinks that since she’s up, everybody else should be as well. Anyway, that’s beside the point. The long and the short of it is that we got to sleep in nicely and then relaxed for a couple more hours – to the point that the boat that we were going to take to a local island had left. It was also too late to pack a picnic like we had discussed, too. Instead we got ready and walked down to Seattle Center for the Taste of Seattle festival that is going on this weekend. So we went to the Taste of Seattle. As we walked along Mercer, I noted that there really weren’t all that many people walking around along the street – I thought it was kind of odd and started worrying that the fair thing wasn’t going to live up to my expectations. Then we turned the corner. All those people whose absence I noted? They were there – and they brought friends. The grounds were packed. Wading in through the masses of humanity, we were greeted by the sight of row upon row of booths offering every kind of ethnic food available (as well as some good old american food). My stomach was pretty darn grumbly by that point, so we made a beeline to a vietnamese place that was selling chicken on a stick and took our food to the fountain to enjoy the sights. For those of you who have been to Seattle Center, you’ll know that in the middle is a large, sunken fountain. Well, that was spraying away and droves of kids were milling around in the water, having a great time. After eating we wandered around a bit more and I realized my mistake. Having gotten a full meal at a single stall, I was stuffed and couldn’t endure the thought of eating more food, the sights and sounds taunting my tongue (which was vigorously reproaching my head and stomach). That being said, though, we had a great time listening to the music, watching the people, doing a little shopping in the Pike Place Market tent fair, and generally soaking up the experience. Oops…must go. Time to walk down to the grocery store and get some food for dinner. Oh, by the way, have I mentioned how much we like Seattle? This is it! This is the one I saw! Fridays are pretty easy days for me. Seattle Central C.C. is closed on Fridays for the summer, so I only teach 1 class on Fridays. I used my free time today for running some errands downtown. We almost never drive here because parking is a pain and the buses are so convenient. So I hopped on a bus after work and went to the downtown driver’s licensing office. I got my license (yay!) and walked a couple of blocks to the library to return some books. It was a beautiful afternoon, so I decided to walk over to Pike’s Place Market to get some cherries. Finally, I hopped on a bus that I thought would take me straight home. It didn’t. The buses in Seattle are numbered clearly, but you have to be careful about the ones marked “express”. They stop at different places. I didn’t notice that the bus I was on was an express until it was way too late. I ended up all the way in Ballard. 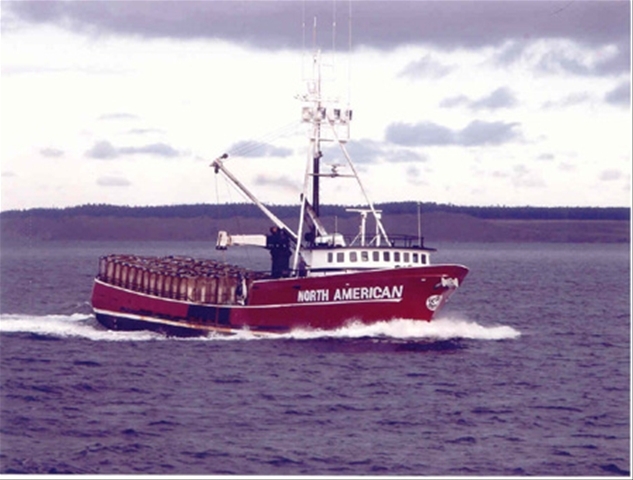 It was a fun mistake, though, because as I was leaving Ballard, I saw The North American, a fishing boat on The Deadliest Catch (it’s a show on the Discovery Channel)! Dave’s not as excited about that as I am. I feel like I spotted a celebrity! I’m not sure if anyone will be reading this since we haven’t written for so long. We had intentions of writing about all of our new and exciting experiences in Seattle but then we never got around to it. Now those new and exciting things are part of our everyday lives, so they don’t seem so interesting anymore. But sometimes I have really great days (like today) and it reminds me of how much I love living here. I love it that I don’t need a car here. I love walking around downtown. I love it that it is summer and I can comfortably walk around outside in the afternoon. I love living so close to downtown. I love looking up as I’m riding the bus and seeing the Sound. Or the Space Needle. Even if I complain a lot about our tiny apartment, I’m really happy here.